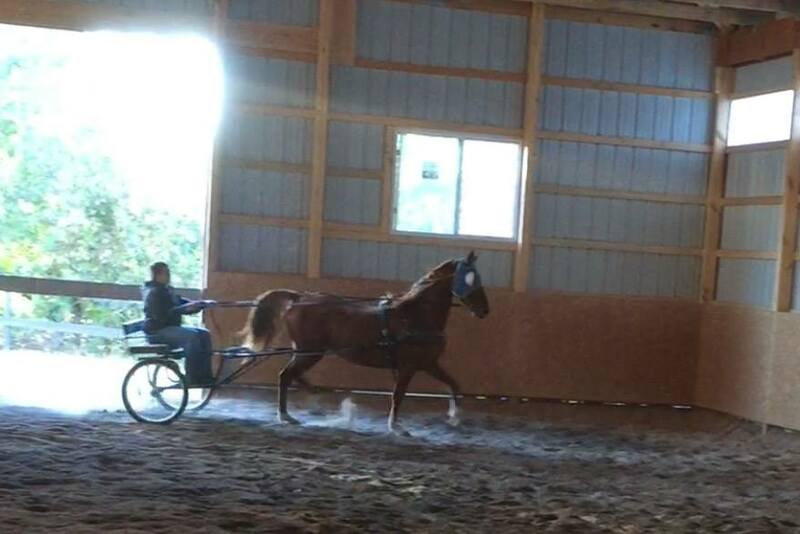 My name is Radiant Roulette, American Saddlebred #147847. My friends call me Penny because I am as bright and shiny as a newly minted copper penny. I am seven years old when I find my new partner, Miss Dodie. I went to live with Miss Dodie on the day before her birthday, October 18, 2016. I am not a very big horse, barely reaching 15 hands when I have shoes on. 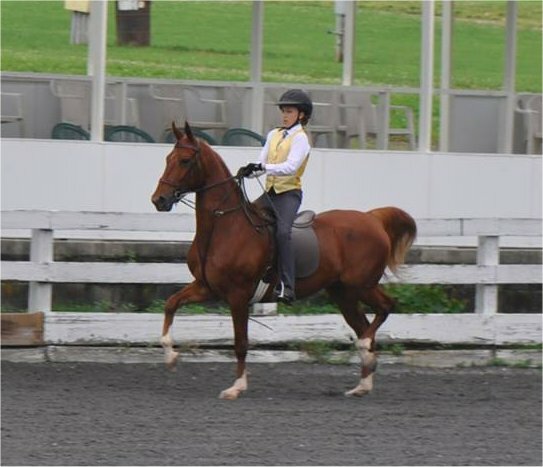 In the world of American Saddlebred showing, I am very small. I have a huge engine and didn’t feel small, but I didn’t get ridden much because I was too forward for youth riders and really didn’t like my job in the show ring. I did get to go to shows for two years and I did look pretty at the shows. However, my small size was against me. I was also trained to drive fine harness. I found this job to be interesting, but again, it involved go around and around in a circle and I quickly grew bored with the work. My show career ended after the 2014 season. It was difficult for me to be competitive against horses standing well over 15 hands. The stable owners decided to add me to their lesson program as I was very well trained and knew my job well. Unfortunately, I started to develop behavior issues because I am smart and I swiftly realized that the students didn’t know as much as I did. I was retired from the lesson program at the end of 2015. From September 2015 until October 2016, I sat in a stall and didn’t get ridden. 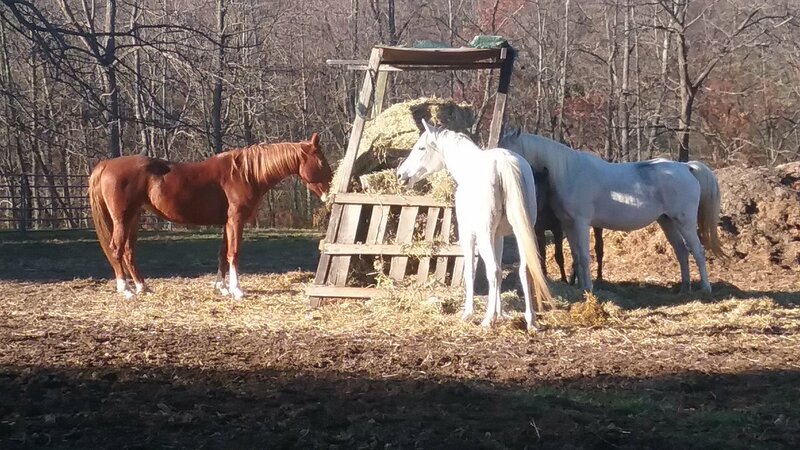 One day, as the leaves were changing colors outside my stall window, Miss Dodie showed up at my stable with her trailer. The stable owners brought me out and handed Miss Dodie my lead rope. She asked me to get into her trailer. At first I was confused, I didn’t know why I was getting into this small trailer, all alone. After some convincing by the stable owners, I finally got into Miss Dodie’s trailer, but I wasn’t happy. I hollered and hollered all the way to Miss Dodie’s farm. 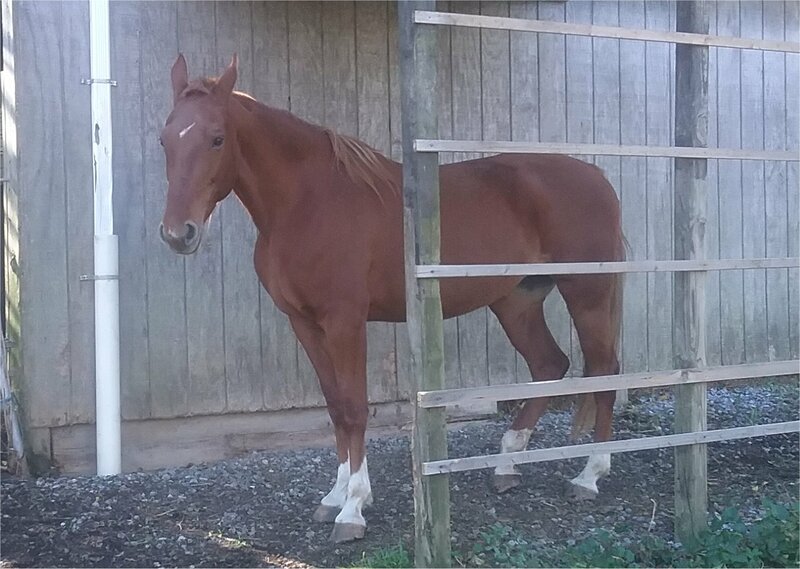 When she took me off the trailer, and I was hollering for my stall neighbor to come and rescue me, several other horses answered me, telling me that this was a wonderful place to live and they would be my new friends, and wait until I found out how many treats Miss Dodie gives us every day. And so, I became Miss Dodie’s new partner. At first I was sad. Miss Dodie’s Arabians didn’t like me much and I didn’t have a stall anymore. Miss Dodie left me out in this huge pasture with several run-in sheds. It’s not the same as having your very own stall. I had to share the sheds with Miss Dodie’s other horses. And there is a young filly in this pasture. Her Mama told me several times to leave the baby alone, but that silly baby was always coming over to me to ask me to play with her. Eventually her mama stopped fussing at me and I found out that running around the pasture playing tag with this baby was very very fun! I could run so very fast and go so very far and kick up my heels and rear up in the air in joy of freedom. Miss Dodie allowed me several days to get acquainted with my new pasture mates. One nice fall day, the sun was shining and the air was warm. Miss Dodie came and got me from the pasture and took me out to be brushed all over. I love to be brushed. She also trimmed all my feet. I found that interesting as I didn’t know Miss Dodie was a farrier, I always thought she was a feeding lady. She put a saddle on me and it felt strange. It wasn’t flat and cold like the saddles I was used to, it was round and she had a thick foam-filled pad underneath it. The saddle sat forward on my back, instead of sitting in the center, and the girth was wide and curved. I didn’t understand this saddle at all. When she mounted up and sat on me, I realized that this was a very comfortable saddle. I could feel everything that Miss Dodie was asking me with her legs and seat and weight shifting. VERY INTERESTING. I was confused, perplexed and unsure of what I should do. Miss Dodie took me into her small ring and started asking me to do very odd things. I had to walk, for starters. Only walking. I had to lift my feet and step over cavalettis. I have to bend my body and move in and out of a line of overturned buckets. I had to stop and back up and then, while backing up she asked me to make turns. WHAT???? What kind of nonsense is this? I was not happy and thought I might tell her in no uncertain terms that this is not what I know how to do in the ring. Miss Dodie was totally unfazed by my antics. Usually, after doing silly stuff for a couple minutes, the rider I was trying to intimidate would get off and I could go back to my stall. MIss Dodie, however, made me to over by the gate and without even getting off me, she reached over and opened the gate and asked me to go through it to the outside. And she took me on a tour of the farm. We rode all around the farm. Up the hill, down the hill, through the woods on these narrow paths and down to the creek. She wouldn’t allow me to do anything but walk. I saw some things that were kinda scary. Miss Dodie asked me to go look at them, because they’re not really scary, so I did. After a while, I learned that if something seemed scary to me, I should walk over and look at it. That was a lot of fun as I started seeing things I have never seen before. My ride with Miss Dodie was very fun and when I got back to the pasture, I told my new pasture friends all about it. Praire was a little jealous because Miss Dodie usually takes her for a walking ride around the farm. Steel was like, “Bah, that’s nothing, wait until she takes you out to a real trail.” And the baby was all sassy and just wanted to play some more. The next day, we got to go around the farm again. She did not ask me to work in the ring first, she simply put that weird saddle on me and took me out and about the farm. She allowed to to drop me head and eat grass. And then I had an itch on my face and she allowed me to scratch my face on my leg. WOW! No-one ever allowed me scratch my face before. I did manage to remove my bridle while scratching my face. When I lifted my head I realized that my bridle was gone. Miss Dodie had pulled it up and was holding it, but she didn’t dismount. Huh. What do I do now? I took a step forward and then another and then another and Miss Dodie didn’t tell me to stop. So I started moving along the trail around the farm and took us all the way back to the barn. I did go faster and faster because Miss Dodie wasn’t telling me not to. By the time I got us back to the barn, I was doing a nice smooth road trot and Miss Dodie was just riding along with me and encouraging me to make turns with her seat and her legs. I could feel everything she asked me and I did a very good job. When we got to the barn, Miss Dodie got off and gave me a big hug. She told me I was very smart to ride around the farm without my bridle on. The next day, Miss Dodie took me off the farm and we walked up to a blueberry farm. I walked along the road and the cars passing me were never an issue. At the blueberry farm, I got to meet a couple people in the parking lot and they petted me and told me how pretty I was. Then we walked back and stopped at a neighbor’s house. I got to show off how pretty I was and meet the neighbor’s horses. I had a lot of fun! I heard Miss Dodie and the neighbor talking about taking me to a trail head. I wonder what a trail head is? Several days go by. Every day when Miss Dodie comes to the farm, I rush to the gate to greet her. She always has a treat for me and she always brushes me. I get very muddy out here in the pasture because I love to roll and roll and roll in the dirt. It feels so good to me. And guess what? There is no dinner bells at my new home. We have all the hay we can eat, all the time, and grass … lots and lots of grass … and the water troughs are always full so we can have a drink whenever we want one. This is a very fun place to live. So, I have been with Miss Dodie for two weeks when she asks me to get into that small trailer again. All by myself. I am not sure I want to leave here. I really like it here. Why is she asking me to leave? I told her I didn’t want to leave and she insisted I had to get into that trailer anyway. Noooooooo, I love it here. I don’t want to leave Miss Dodie and my new friends. Sadly, I gave up and got on the trailer. I called and called and called out to my new friends and told them good-bye. I was so sad. I was only in the trailer for about twenty minutes when we stopped and Miss Dodie asked me to get out. I find myself in a parking lot full of cars and a couple horse trailers. OH NO … she brought me to a show. I don’t want to be in a show. I am so very very out of shape because no-one rode me for over a year. And my hair is a mess, and I’m covered in dirt, and this is just not right. I call and call for Miss Dodie to take me back home. I don’t want to be embarrassed at a show today. She ties me to the side of the trailer and starts brushing me. Then, without putting any ribbons on me, or spraying me with showsheen, or painting my hooves to make them shiny, she put that weird saddle on. Dang, I am not going to be able to do my job in this saddle. It sits in the wrong place on my back for me to be able to step up and step out smartly. That neighbor I met the other day shoes up with her horse. Now, that’s interesting. That neighbor is also just brushing off her horse and throwing a saddle on him. No fussing around and getting gorgeous. Miss Dodie gets on and asks me to move out. Wait? Where is the ring? I don’t see a ring? All I see is a lake. WHAT IS THIS? And you want me to walk through this? NO WAY! Miss Dodie is telling me this is called a creek and I certainly can walk through this. OH NO, it’s mushy and the footing doesn’t feel safe and no no no no. Miss Dodie pats my neck and tells me she has all day so I can either cross over this and follow along behind the neighbor or I can sit here and look silly. I put my head down and sniff it. It smells like water. I taste it and it IS water. So I take a drink. When Miss Dodie doesn’t tell me not to, I am suddenly very thirsty so I take a long drink. And there was a bit of grass there so I ate that. And Miss Dodie didn’t tell me not to so I tasted some leaves and part of a bush. They didn’t taste so good. Finally, I decided that I can walk through this mucky icky mud and I do so with my best Lipizzaner impression. I keep my feet as high as possible to get through that without getting my feet dirty. It didn’t work, I still got my feet dirty. And it wasn’t so bad. And Miss Dodie took me through several of these creeks that day and eventually I completely forgot to worry about getting my feet dirty. Becoming an endurance horse is hard. 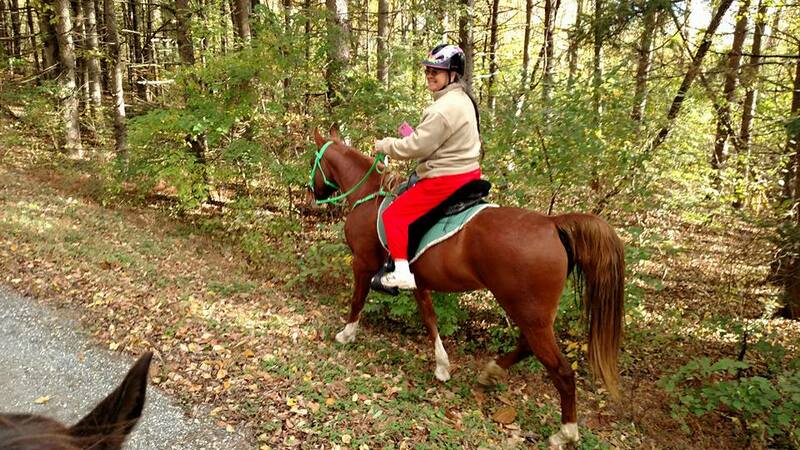 Miss Dodie told me that endurance horses ride on trail for 50 miles and they have to do it in under 12 hours. And there are vet stops during the ride where the vets check us out to make sure we are still sound and our metabolics are doing well. If we are not sound or our heart rate is too high, we are not allowed to continue the race. Miss Dodie said it will take me all winter to get in shape if we ride three times a week and start building up stamina and getting my muscles fit. She said that next year I will be allowed to compete in shorter distances called LDs (Limited Distance) which is only 25 miles. 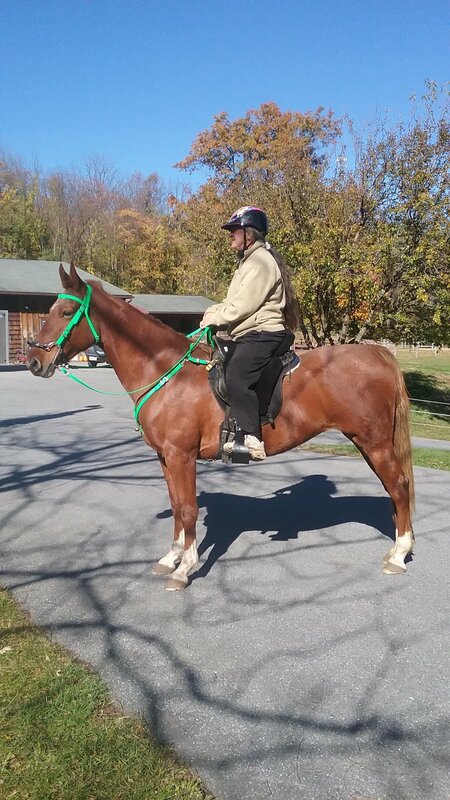 After I do one year of these kinds of rides, and show that I can take care of myself, she will allow me to be a real endurance horse and in 2018 I can do 50 miles. So the next ride Miss Dodie took me on, she allowed me some trotting. This is my second trail ride and I already figured out what I’m supposed to do. In fact, I don’t even need another horse to follow, I just want to be the leader and Miss Dodie let me be out front the entire ride. If you, the reader, have a Facebook account, you can see my video here. Miss Dodie told me that I was going to be a most excellent endurance horse. 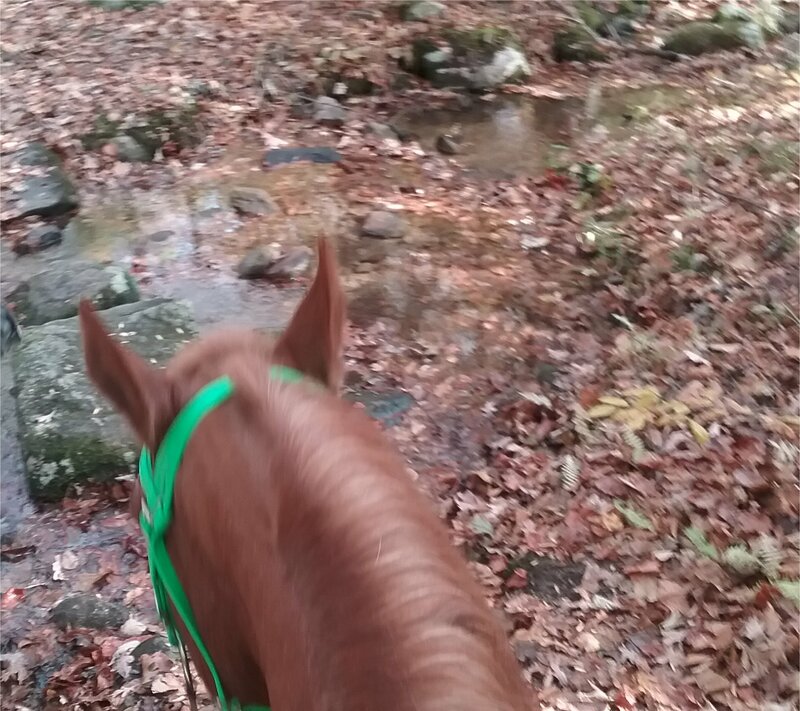 On my second trail ride, we did 8 miles and although I was sweaty because we did some trotting, I was still wanting to do some more riding. I like this new saddle and the way Miss Dodie rides me. My reins are loose and I can put my head stretched out so I’m more comfortable and she lets me pick where I walk. I love this new job. It’s awesome. On my third trail ride we had some scary things happen. Miss Dodie took me along the back of a gun range where there were lots of people shooting guns. There was a gun that was very very loud and went “BOOM” every now and again and another gun was rapidly firing “POP POP POP POP”. And other guns and we were very close and the sound was making me crazy. At first I wanted to run away but Miss Dodie said we would not get shot. She promised they were shooting in the other direction. We walked along and I insisted that I be first, just in case I had to run away. I was jumpy but Miss Dodie totally ignored my fear and just rode along talking to her friends on the horses behind us. By the time we got past the gun range, I had figured out that Miss Dodie didn’t lie to me and they didn’t shoot us so it was all good. 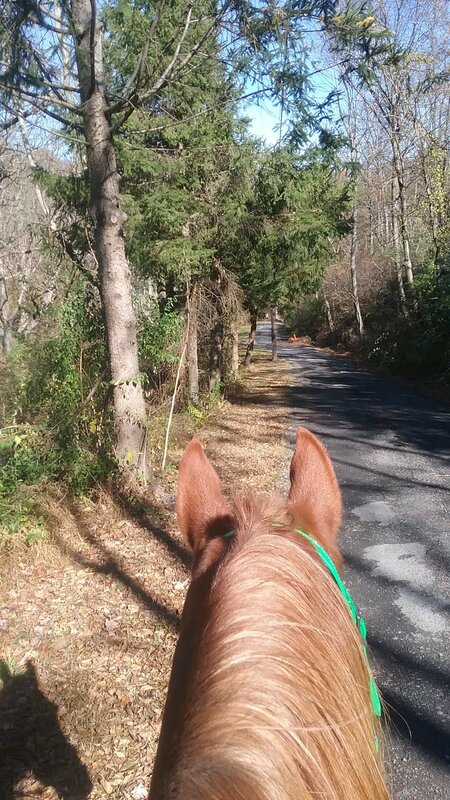 And she let me lead the ride and I only got scared at one squirrel that ran across the path as I was trotting. It startled me and Miss Dodie allowed me to chase it down and see what it was. After that, I knew I would never be afraid of a squirrel again. We did 10 miles and I was still wanting to do more miles. Miss Dodie told me we needed to take it slow and easy so my muscles didn’t get injured, they would just get strong. My next trail ride was all alone. We went to the first trail I did so I kinda knew where we were going. Miss Dodie allowed me to trot along the lake and that was very fun! I was looking at everything and trotting and the air felt wonderful. We enjoyed each other’s company very much AND WE DID 12 MILES! I felt wonderful and we had a great time. I really love my new job and Miss Dodie. She says I am going to be the best endurance horse in the universe! She also told me not to be intimidated by all the Arabians I will meet at these endurance races because any breed horse can do this sport if they’re willing to travel lots of miles and enjoy themselves. I am totally willing and look forward to our next ride. I had a long conversation with Steel, who has competed a thousand endurance miles. She told me that this is the best job in the world because I will get to eat anything I want and the people at the vet holds treat us like gods. Oh yeah, I want to be a horse god!